: ปืนหลัก ขนาด 76 มม. ปืนรอง ขนาด 40/30 มม. และ 20 มม. 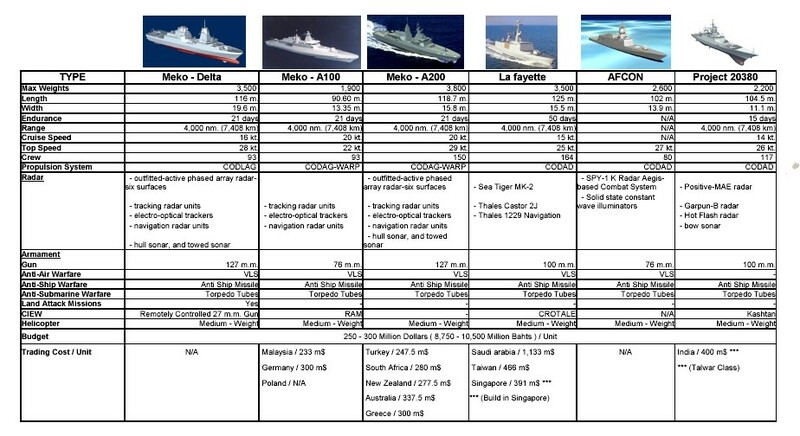 MEKO A-200 AEGIS ขนาดราวๆ 4,000 ตัน ยาวประมาณ 118-120 เมตร ติดตั้งระบบอำนวยการรบ AEGIS ชุดเล็ก และเรด้าร์ SPY-1K ระยะตรวจจับ 250 กิโลเมตร รองรับจรวด ESSM ASROC และ SM-2 block 3 ได้ สามารถติดตั้ง MK-41 VLS 16-24 cell (หน้าและกลางลำตัว) แท่นยิง RAM-21 นัด และ ระบ ฟาลังคฺ์ที่โรงเก็บฮ. แต่ ผมยังเคืองเยอรมัน ที่ยึดเครื่องบินพระที่นั่ง เป็นตัวประกัน ยังไม่หาย ..
พิมพ์ตกครับ...."โครงการนี้ถ้าหากได้เรือจากเยอรมันแล้วมี option เรือดำน้ำ 2+2 มาด้วยคงได้เป็นนิยายที่จบลงแบบ Happy Ending"
4 turbine a gas G.E. 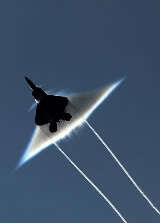 LM 2500 da 100.000hp. ในยุคหลัง ทร. เปลี่ยนปืนรองจาก 40 ม.ม. เป็น 30 ม.ม. คราวนี้เรือรบหลวงนเรศวรจะได้สมบูรณ์แบบสักทีครับ ใจจริงอยากได้ Sigma seahawk ที่สามารถติดตั้งจรวด mistral ได้ 6-7 นัดต่อแท่นด้วย นอกจากปืน 30 มม. 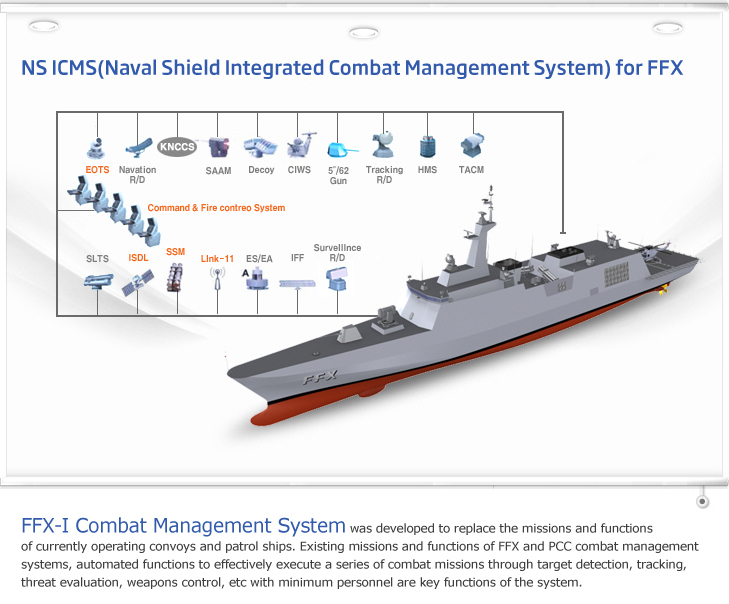 Global Combat Ship with its weapons and systems illuminated in blue. 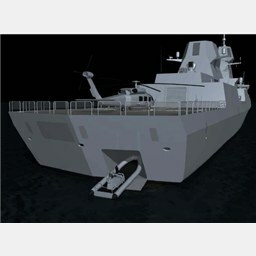 Royal Navy ships will use the Artisan 3D search radar, Sonar 2087 (towed array sonar) and Sea Ceptor (CAMM) air-defence missiles launched via a Vertical launching system (VLS). 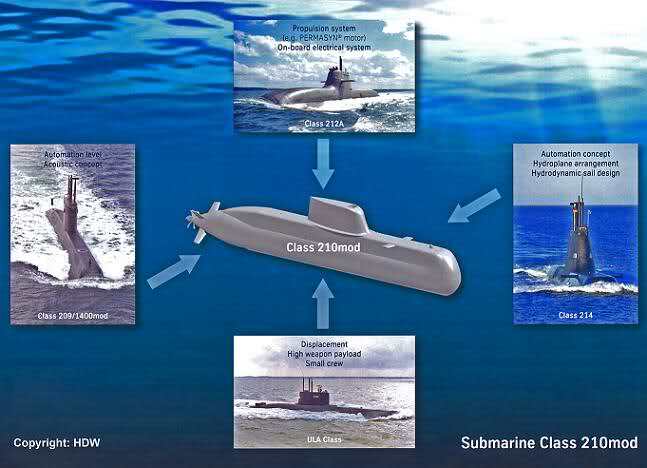 In addition, like the Type 23 frigates that they replace, Global Combat Ship will be equipped with a torpedo launching system probably utilizing the Sting Ray acoustic homing light-weight torpedos, or alternatively a next generation of Royal Navy torpedoes. 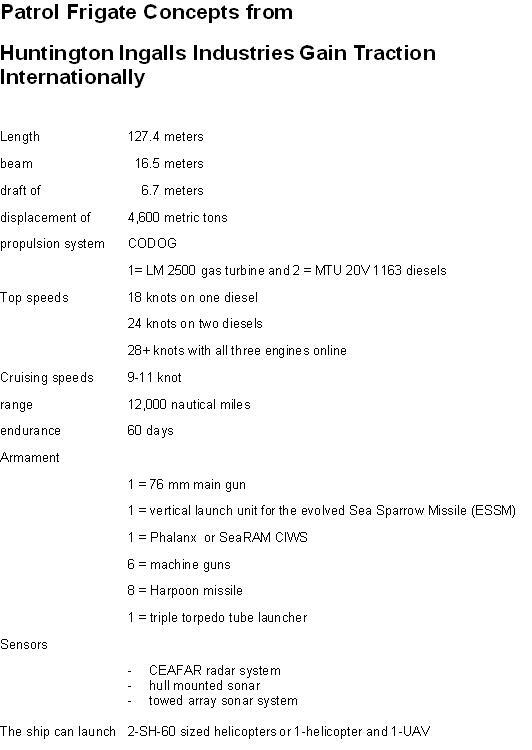 It is also expected that the GCS will initially be equipped with two quadruple missile launchers for the Harpoon anti-ship missiles. 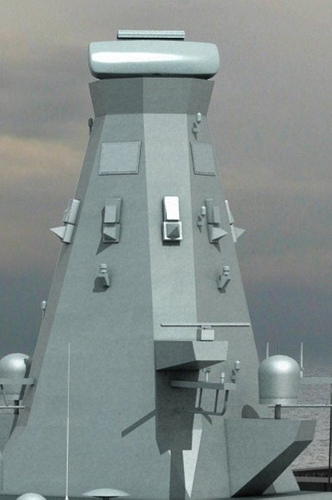 However, in early 2012, BAE Systems released a "New Design" Type 26 Global Combat Ship that showed an additional 24 cell "Main Strike" VLS positioned behind the Sea Ceptor (CAMM) air-defence missile VLS. 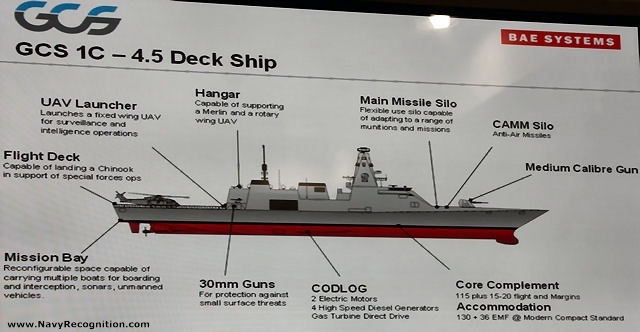 This would instead provide the option to equip the Type 26 Global Combat Ship with a new generation of multi-role (anti-ship & land-attack) cruise missiles (see CVS401 Perseus) and drop the current Harpoon missile altogether. The main strike VLS could also accommodate Tomahawk land attack cruise missiles. 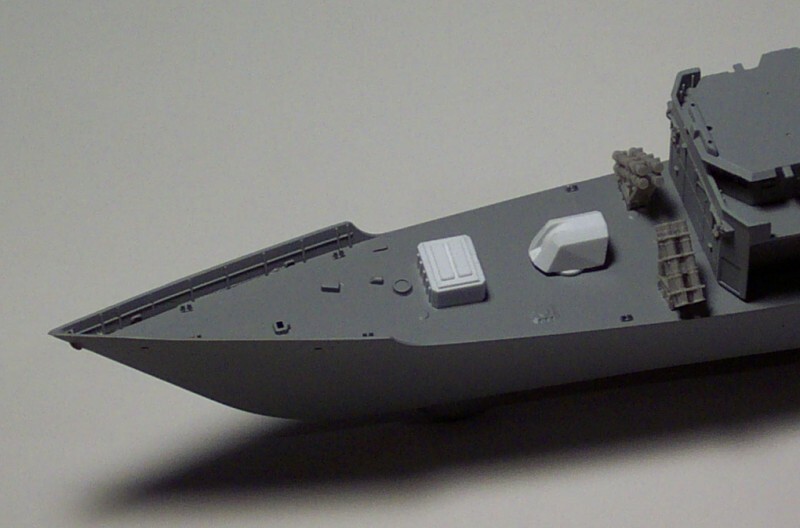 The Type 26 will be fitted with guns of various calibres. 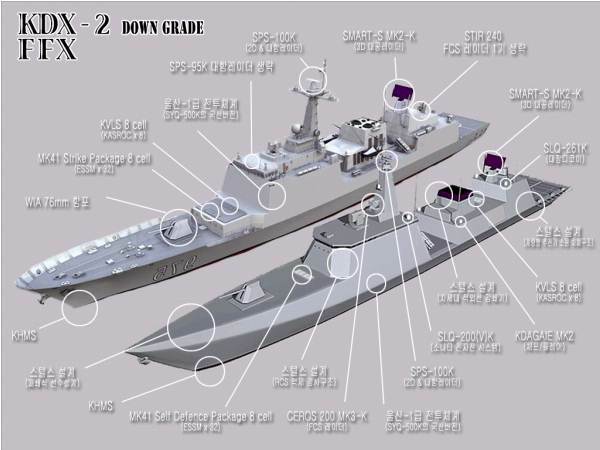 It is expected that the main gun will be either the "127mm Medium Calibre Gun" or the BAE Systems 4.5 inch Mark 8 naval gun as well as two Phalanx CIWS. 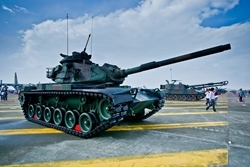 In addition, smaller guns include two 30mm DS30M Mark 2 Automated Small Calibre Guns and a number of miniguns and general-purpose machine guns. 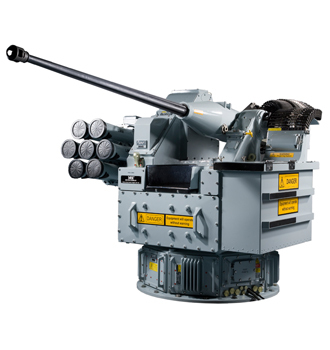 Since the release of BAEs new design Type 26 it appears that the two Phalanx CIWS have been re-added to the weaponry. 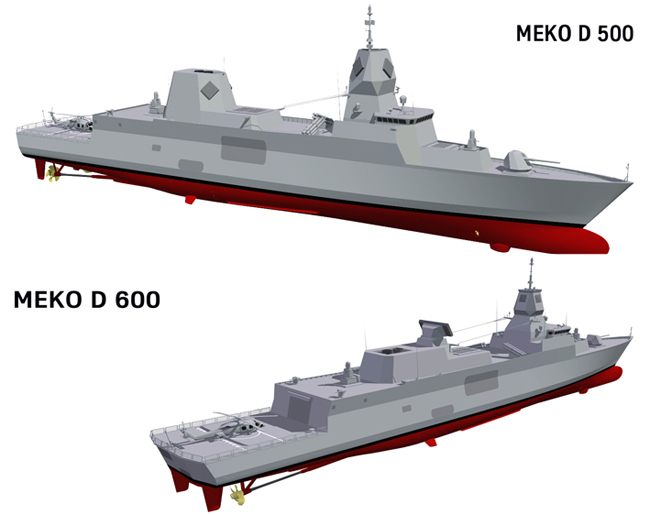 Britain needs foreign markets to keep the per-unit costs of the new frigates down enough to keep them affordable. 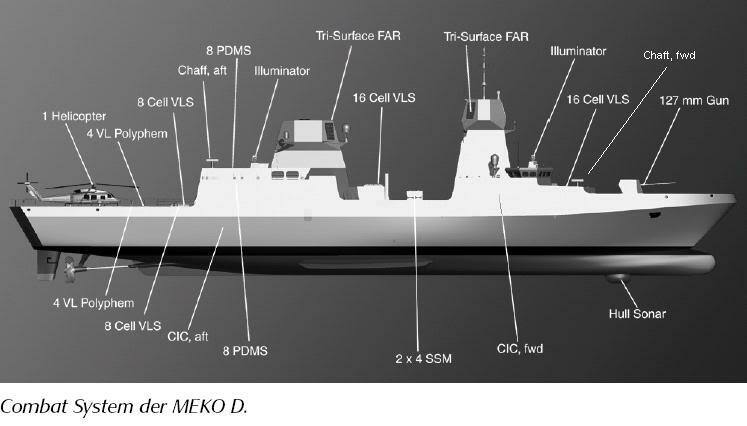 As of 31 January 2011 Malaysia, Australia, New Zealand and Turkey had all expressed interest in collaborating on the Global Combat Ship, and the UK was in "close discussion" with Canada. 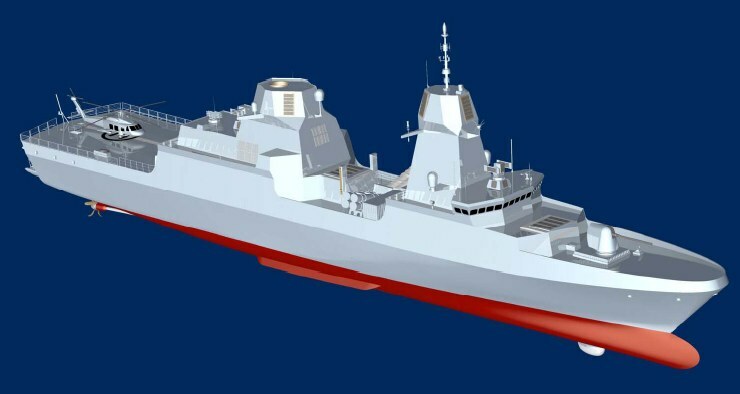 A Canadian union campaigned that the Global Combat Ship threatened Canadian shipbuilders and in the run-up to the May 2011 election a spokesman for the Canadian Defence Minister ruled out involvement with the British programme. Turkey also later rejected the design as not meeting its requirements. 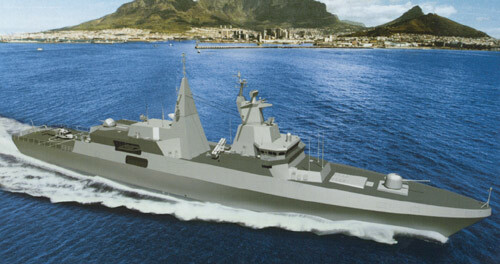 In January 2010, Janes Defence Weekly reported that the governments of the United Kingdom and Australia were exploring the potential for cooperation on the C1 and C3 designs, which corresponds closely to the Royal Australian Navys requirements in replacing its MEKO-200 Anzac-class frigate with a new frigate type (Project SEA 5000). 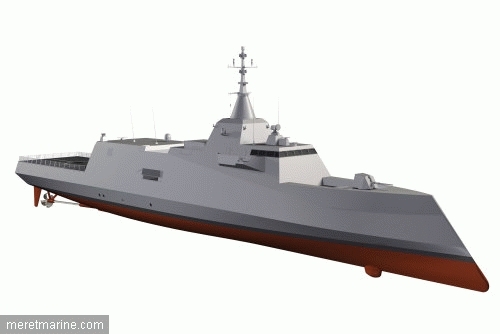 An initial decision for the frigate replacement is not expected until at least 2018. Absalon .....อเนกประสงค์ กู้ภัยได้ ขนรถถังได้ RO-ROเด็ค อาวุธหนัก ราคาดี (300กว่าล้านยูเอส ) 32 Mk56 +Smart-s+Scanter +5นิ้ว+16ฮาร์พูน!!! ใส่ไปแล้วครับ ท่าน champ ในชื่อ ESSM ครับ..
ยังไงถ้าทางสะดวกปั๊บไม่ต้องเกรงใจใครอีกคงได้เรือดำน้ำทันที แต่คงต้องจัดหาชุดใหญ่ครบทั้งกองเรือเพื่อตามให้ทัน เป็นเป้าให้สื่อโจมตีมันแน่ๆ แล้วยังต้องเรือฟรีเกตชั้นดีอีก 2 ลำเพื่อให้ทัดเทียม หรือไม่ก็ต้องไปจัดหา harrier มือสองเพื่อเพิ่มอำนาจการยิงให้กองเรือบรรทุกบ. รมว.กลาโหมแจงซื้อฟริเกตแค่ 1 ลำ 1.5 หมื่นล้าน ยันให้สิทธิ์ ทร.เลือกแบบ ปัดปลอบใจหลังแห้ว "เรือดำน้ำ"
The cabinet yesterday approved a navy proposal to buy two top-class frigates costing around 30 billion baht within the next five years. 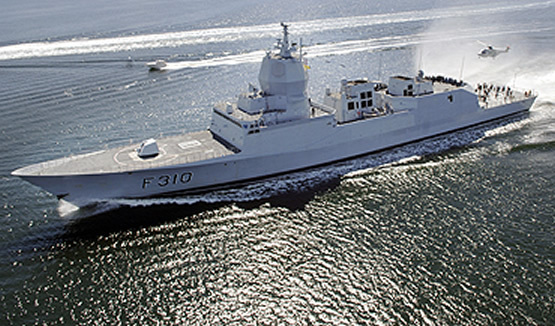 According to a source, the navy has turned to frigates following the governments rejection of its preferred option to purchase submarines from Germany. The navy has yet to choose a supplier. It favours frigates from European shipyards which have good track records of building such top-quality frigates, the source said. 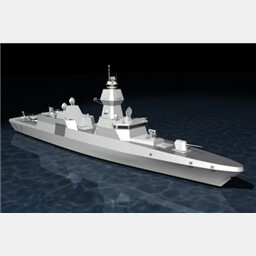 Builders in Germany and Spain are tipped to win the contract to supply the warships for the navy, he added. However, senior naval officers are concerned that some politicians might try to push for the purchase of Chinese-made frigates. 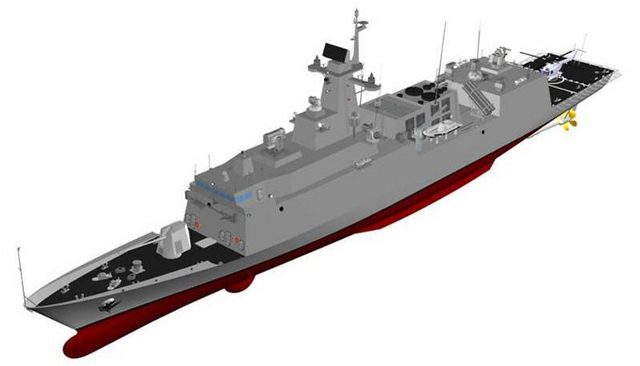 The navy currently has two frigate flotillas that are capable of launching surface-to-surface missiles. They are all equipped with helipads. 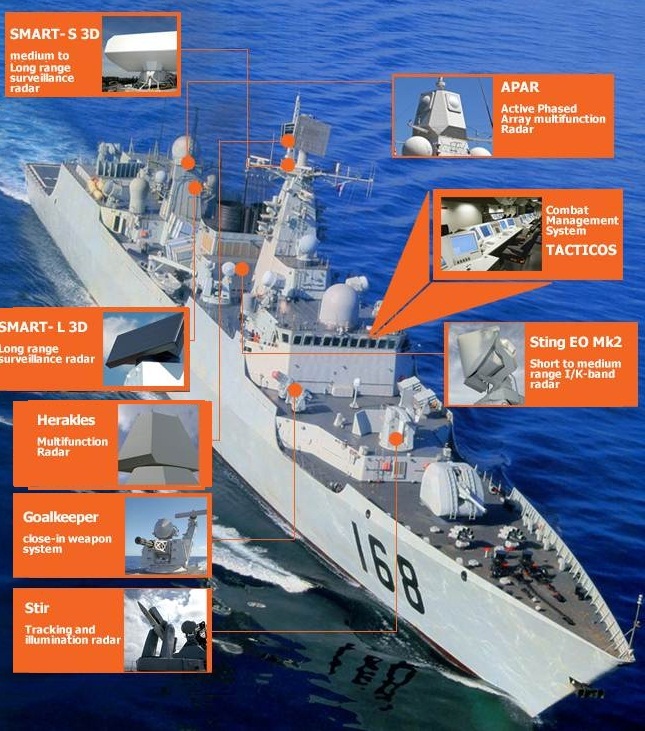 Frigates can defend national waters, operate with fast attack craft, battle other surface vessels, defend against aircraft, as well as protect other vessels and combat submarines. 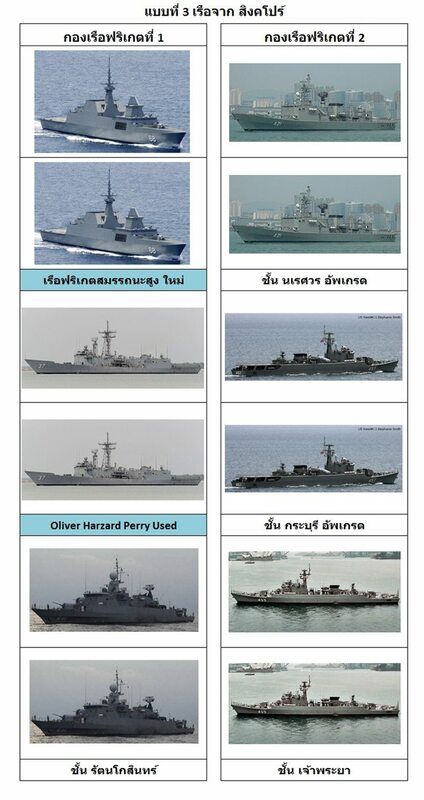 The navy also intends to keep the frigate, HTMS Naresuan, in service. The cabinet yesterday allowed the navy to borrow 3.29 billion baht from 2012 to 2014 to pay for a refit and to modernise its computer systems which will allow the vessel to link up with the information systems used by the air forces Gripen jet fighters. The cost of the work will come to 495 million baht this fiscal year, 1.33 billion baht in fiscal year 2013 and 1.46 billion baht in fiscal year 2014. The cabinet also approved yesterday a request by the army for permission to borrow 2.82 billion baht to buy helicopters. 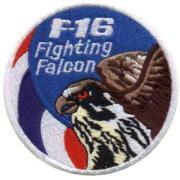 This will take place through to the 2014 fiscal year. 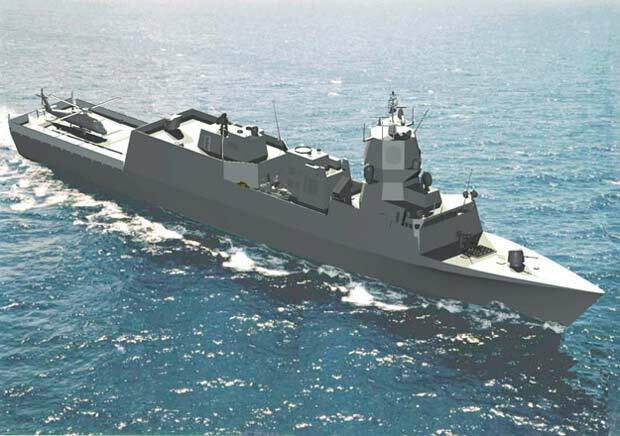 Thailand’s government is thought to be interested in equipping the Royal Thai Navy (RTN) with two to three new frigates. 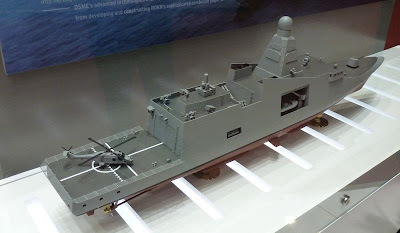 In response to this, South Korea’s Daewoo Shipbuilding and Marine Engineering (DSME) unveiled a new frigate concept, the stealthy DW 3000H, at the Defense & Security 2012 Trade Show in Bangkok, Thailand. Principal dimensions of the DW 3000H are a length of 114 meters, a beam of 13.8 meters, a depth of 8.2 meters, a draft of 3.9 meters, and a displacement of 3,000 tons. 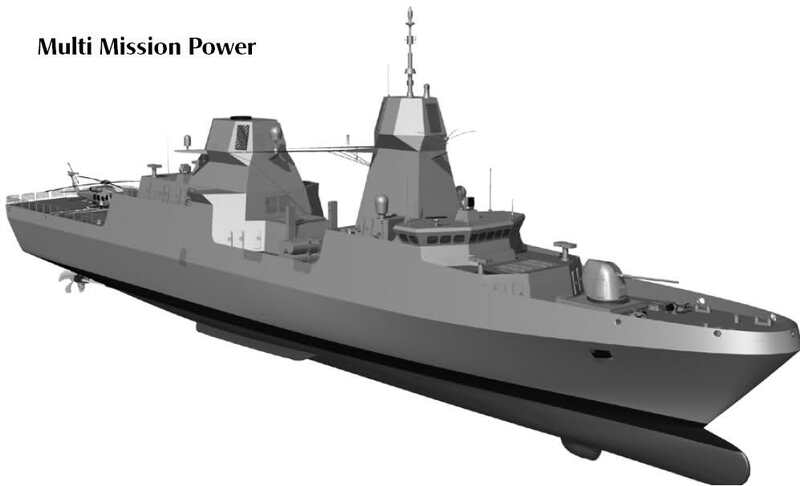 The frigate’s propulsion system is a combined diesel and diesel arrangement driving two controllable pitch propellers for a top speed of 28 knots. 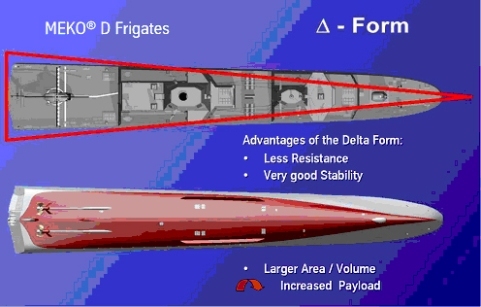 To improve seakeeping characteristics, the hull has a pair of adjustable fin stabilizers and two pairs of bilge keels (strakes running along the length of the hull). In common with other contemporary warship designs, the DW 3000H features an integrated mast – Thales’ I-Mast 500 most likely fitted with ESSM (Evolved Sea Sparrow Missile) uplink/control capability. Fire-control equipment includes a forward-facing gunfire-control director – a Thales Sting – atop the bridgehouse and a rear-facing Thales MIRADOR electro-optical director atop the helicopter hangar. 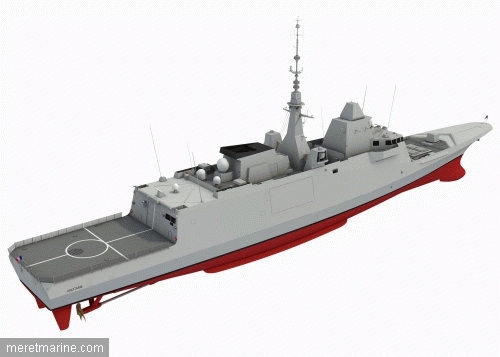 The DW 3000H is to be multirole frigate with a focus on anti-submarine warfare (ASW). 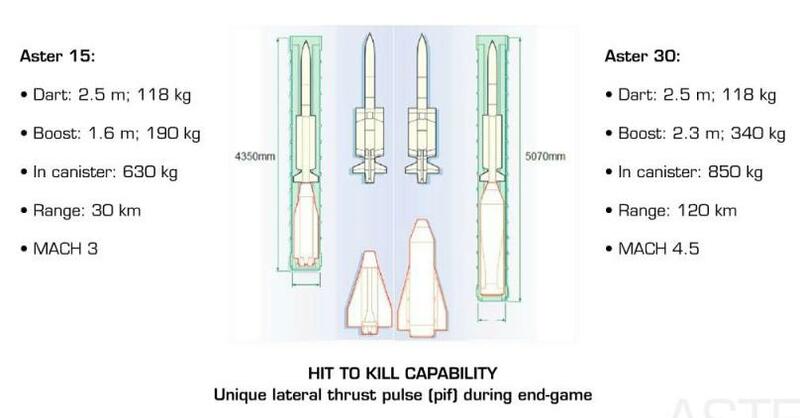 Primary weapon systems are a single Oto Melara 76 mm gun in a stealth turret, an eight-cell vertical launch system for surface-to-air missiles – very likely the ESSM, eight surface-to-surface missiles – most likely American-built Harpoons or the equivalent Korean-built SSM-700K in two quad launchers located amidships, two 30 mm MSI DS30 guns fitted atop the hangar deck and a Phalanx close-in weapon system that is mounted one deck higher. 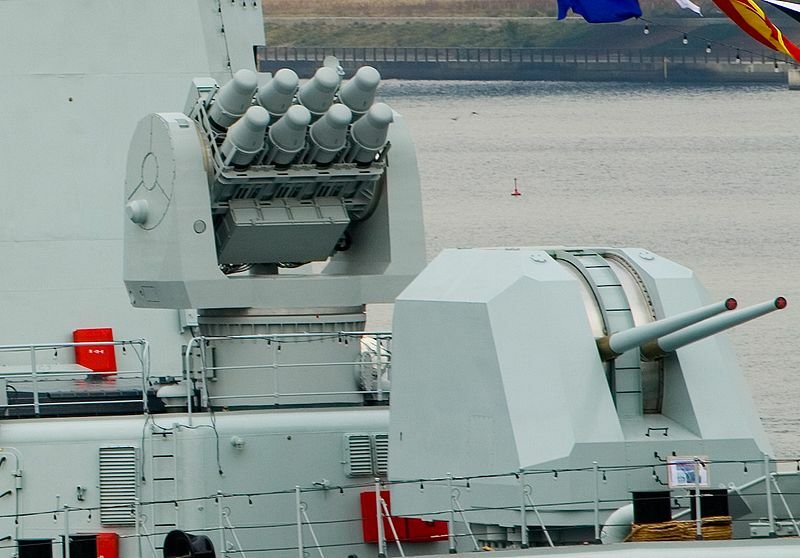 A pair of decoy launchers is also fitted. 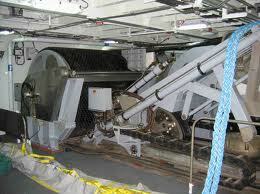 The ASW suite comprises two triple-torpedo tubes in enclosed recesses on the main deck level as well as what appear to be two anti-torpedo decoy launchers mounted atop the hangar deck. 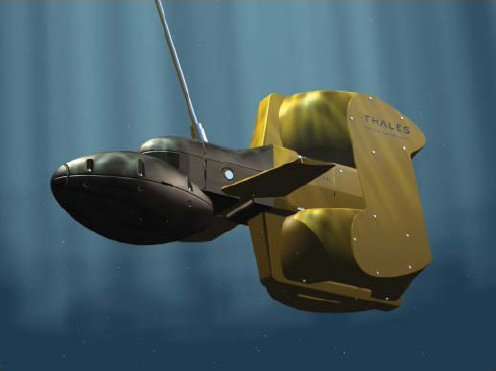 A hull-mounted sonar is fitted in a retractable sonar dome, though it is not clear if a towed array system is fitted. 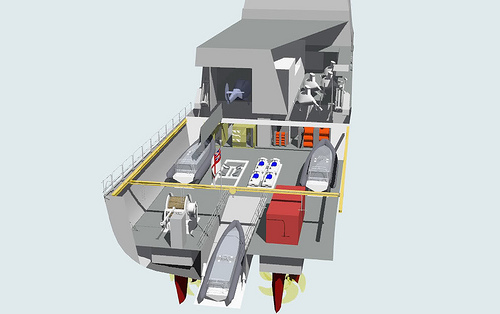 The frigate can accommodate one helicopter in the hangar. The display model shows a Lynx helicopter. 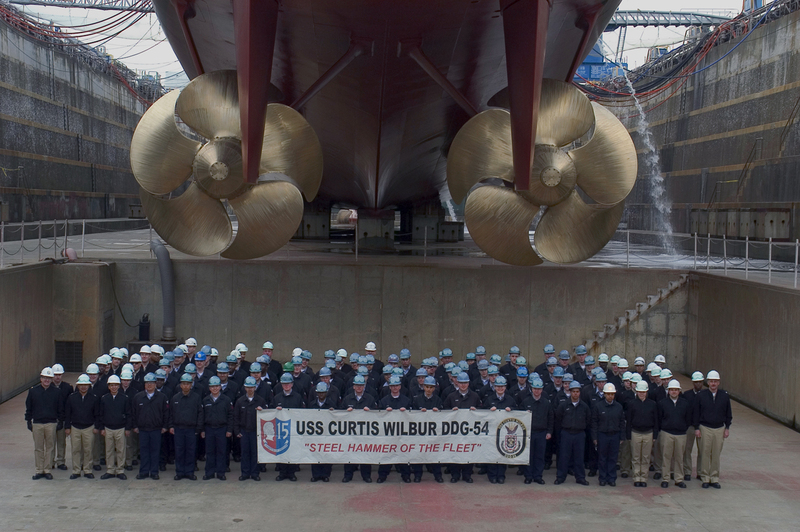 Stealthy features include an enclosed foredeck, enclosed boat decks on either side of the superstructure, and enclosed bridge wings that extend from the slab-sided superstructure, as well as funnels that are shielded by the superstructure in profile. 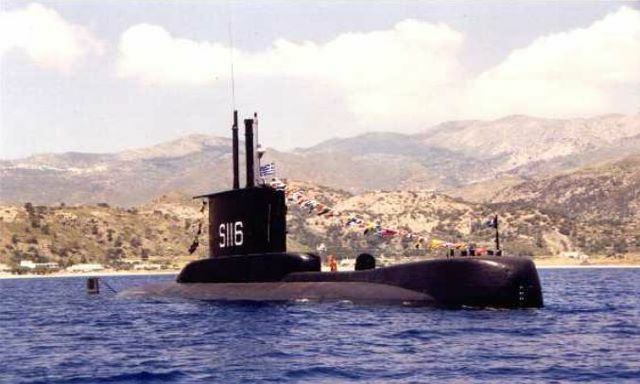 There are indications that if the Thai government decides to move ahead with the frigate acquisition, the Thai Navy’s long-standing and, oft delayed, submarine plans may not be adversely affected. ผมก็ดูไปที่เรือจีนว่ามีรุ่นไหนแบบไหนที่พอจะเข้าแก็ปกับ ทร. ไม่งั้นเหนื่อยแย่ครับ เหตุผลดีๆ ร้อยแปด เข้าวินแน่เรือเยอรมันแต่การเมืองจะเอาของจีน แบบนี้จบครับ..
ตัวเลข สมมติ ในความเห็นส่วนตัว สำหรับ OHP Mod จำนวนสัก 4 ลำ ครับ..
แบบเรือ เกาหลี FFX แบบนี้ ไม่แน่ใจว่า จะอยู่ในข่าย เข้าแข่งขันหรือเปล่า ? 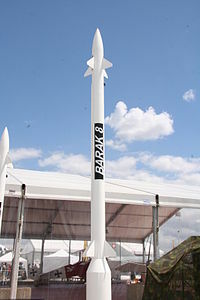 The Government of Thailand has requested a possible sale of nine Evolved SEASPARROW Missiles (ESSM); three MK25 Quad Pack canisters; and four MK783 shipping containers; spare and repair parts; support and test equipment; publications and technical documentation; personnel training and training equipment; U.S. Government and contractor engineering; technical and logistics support services; and technical assistance and other related elements of logistical and program support. The estimated cost is $18 million. This proposed sale will contribute to the foreign policy and national security of the United States by increasing the ability of Thailand to contribute to regional security and improving interoperability with the U.S. Military in operational and exercise scenarios. 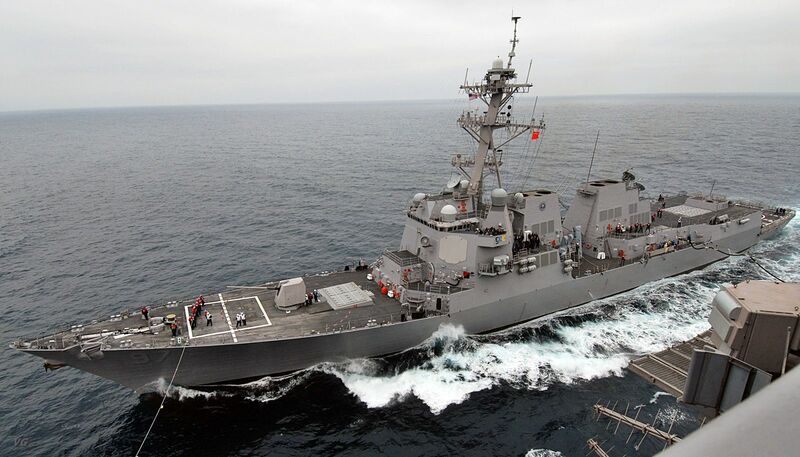 It is consistent with U.S. national interests to assist Thailand in developing and maintaining a strong and ready ship self-defense capability which will contribute to the military balance in the area. 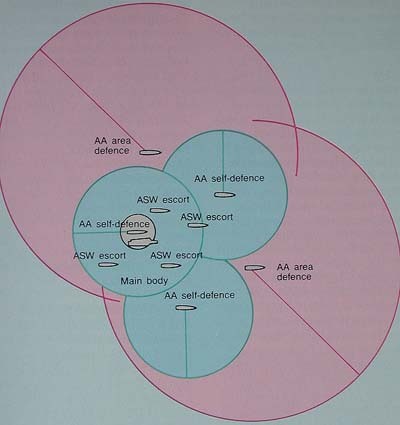 ESSM provides ship self-defense capability. 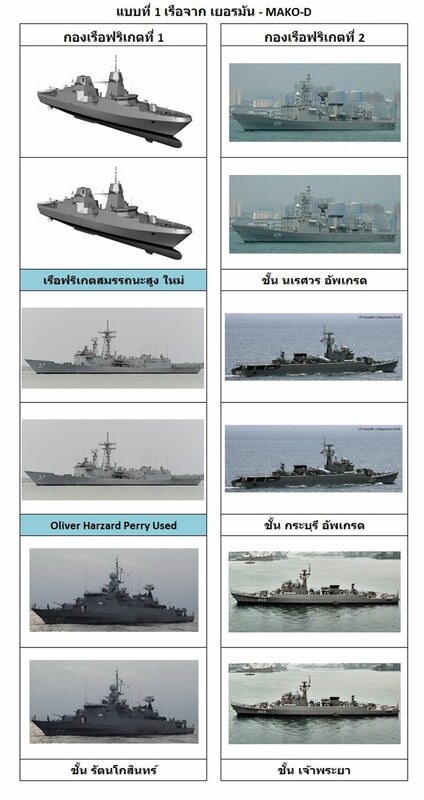 The proposed sale will add to Thailand’s capability to meet current and future threats from anti-ship weapons. 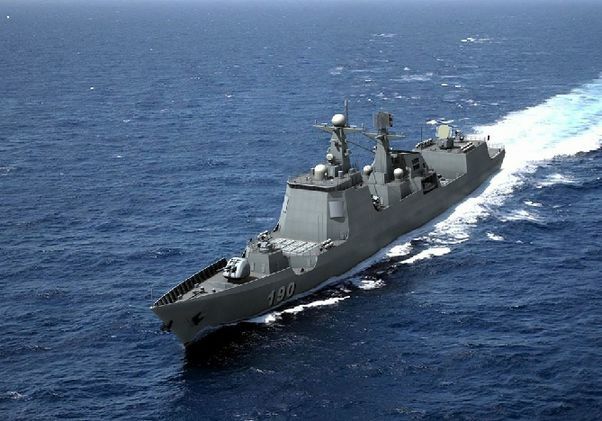 BANGKOK, September 24 (Xinhua) -- The Thai government has recently approved the purchase of two medium-sized frigates with a budget of 1 billion U.S. dollars after denying allegation about the countrys navy persistent request for submarines. The ships will beef up the capability of the Thai maritime force in patrolling the countrys territorial waters in the Gulf of Thailand and Andaman Sea, the navy said. Navy Chief Admiral Surasak Rounroengrom has officially denied media reports that they prefer frigates made in China than those made in Germany. The admiral said that the navy is still waiting for studies and suggestions by an ad hoc procurement committee to decide where these frigates should be procured. 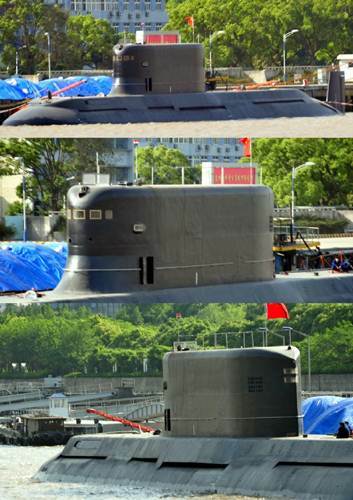 The navy, which had been earlier reported to be interested in buying a fleet of four second-hand U-206A submarines from Germany, will meticulously consider the German-made frigates but it is not also discounting the China option, a high-ranking navy officer said. 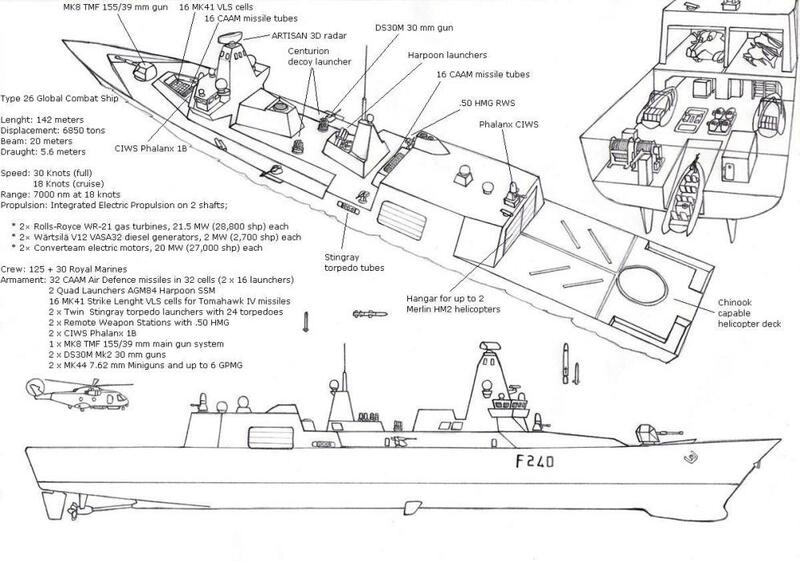 The 1-billion-US dollar fund, approved by the Yingluck Cabinet for the procurement of the frigates, is to be spent for a 10-year period, beginning from current fiscal year. 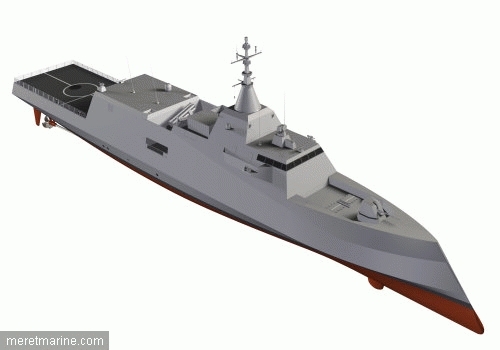 The two frigates are unlikely be procured at the same time, the navy officer said. 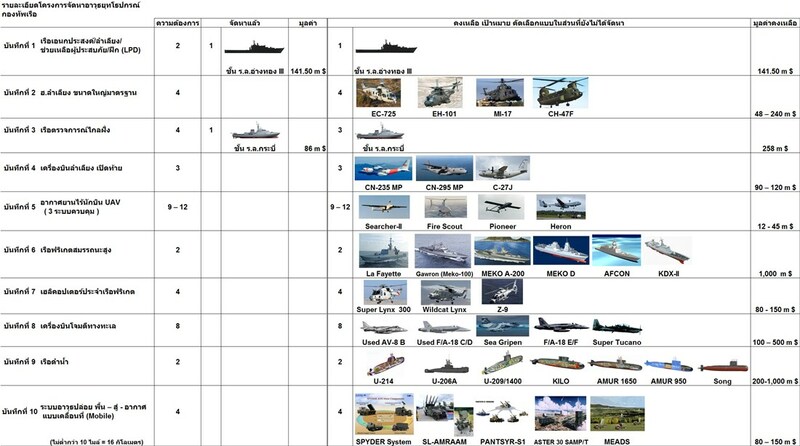 The navy is reportedly looking for boats with an approximate 4, 000-ton displacement, which might be either brand-new or secondhand, depending on specifications and preferences of the commanding admirals. 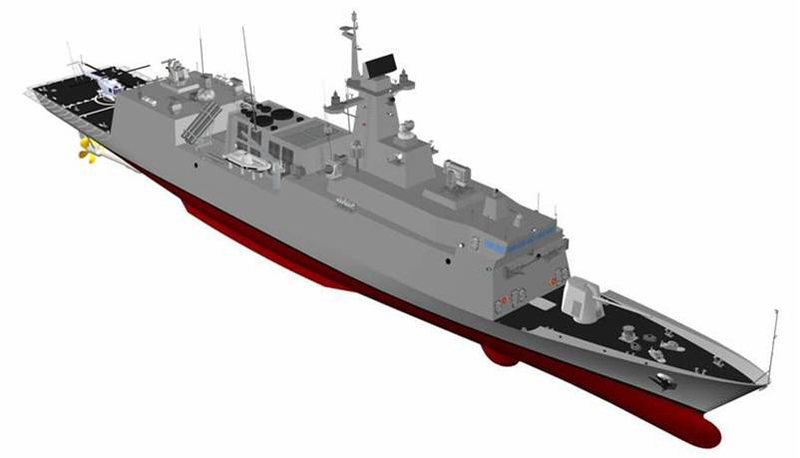 The two frigates to be acquired will replace two US-made, Knox- class frigates, namely HTMS Phutthayodfa Chulalok and HTMS Phutthalertla Napalai, both scheduled to be decommissioned in 2015, Defense Minister Sukumpol Suwanatat said. 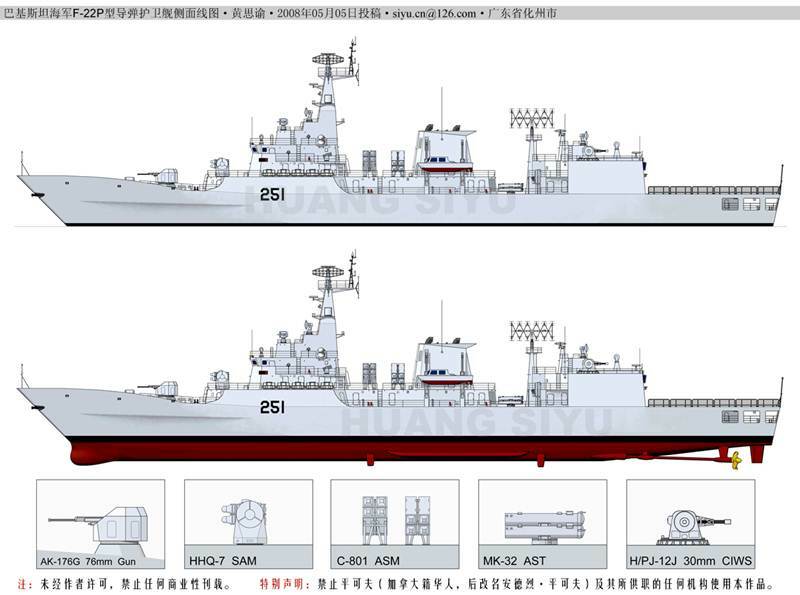 The two frigates would be capable of engaging in three possible combat scenarios with simultaneous maneuverability: anti-aircraft, anti-surface ship and anti-submarine warfare. 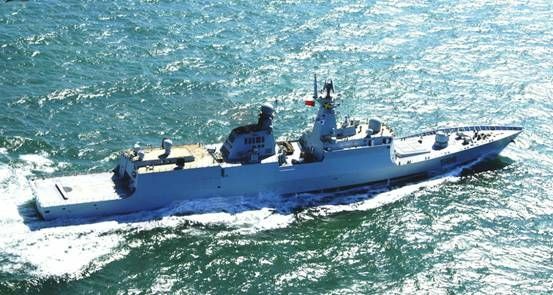 One possible candidate is Chinas Type 054A "Jiangkai II" frigates, featuring 4,000-ton displacement, 30-knot speed, 8,000- nautical mile maneuverable range. 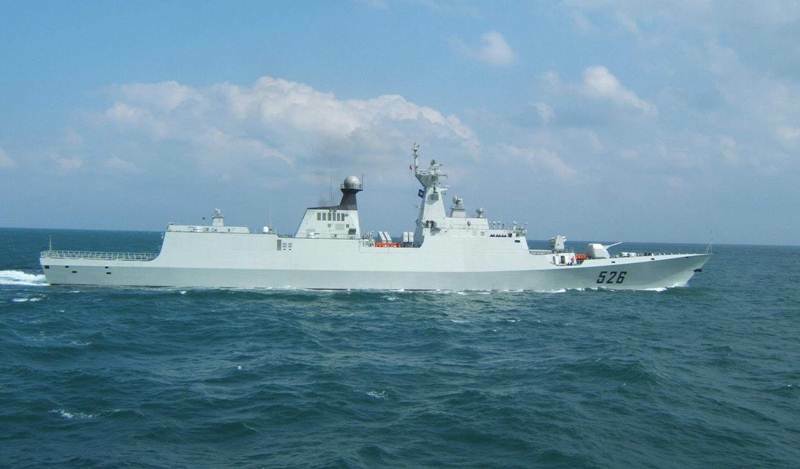 The Chinese ships cost about 255 million U.S. dollars each. 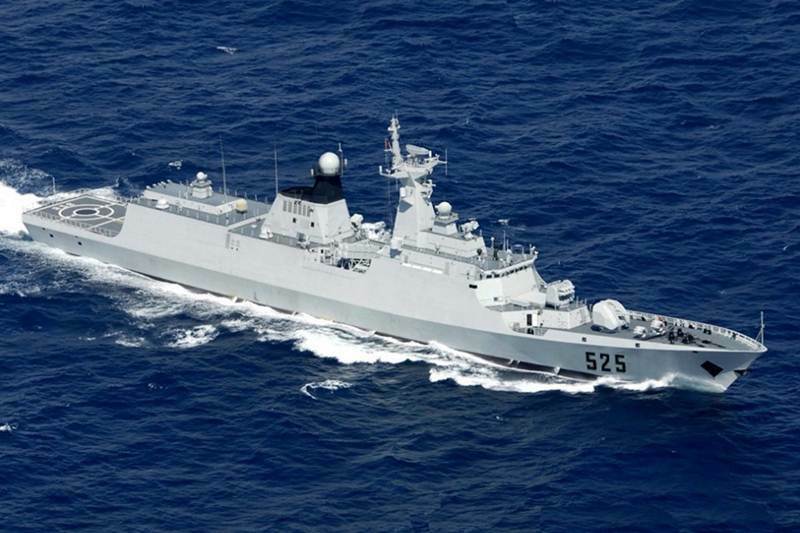 The Thai navy now has four secondhand Type 053T "Jianghu" frigates, built in China, which have 2,400-ton displacement, 32- knot speed and 4,000-nautical mile range. 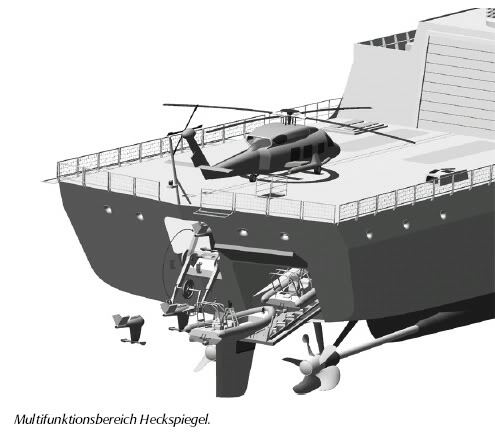 The Thai navy is also considering a German-made, Bremen-class F122 frigate with a 3,700- ton displacement, 30-knot speed and 4,000-nautical mile range. 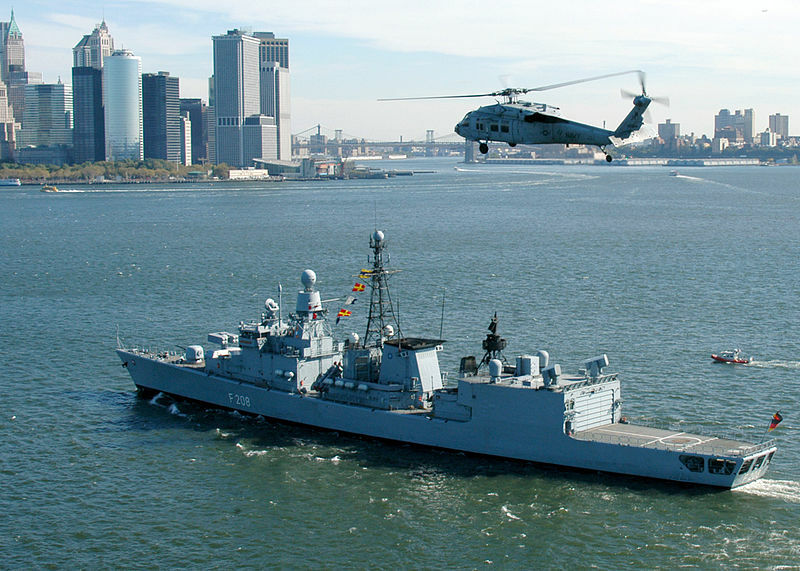 The German navy has planned to decommission and replace the F122 frigates with more sophisticated F125 Baden-Wurttemberg-class frigates in 2016. 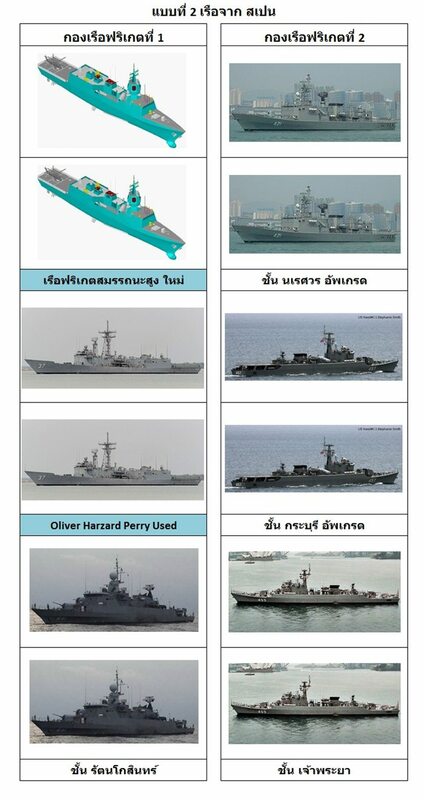 A big procurement project of 2 frigate ships for 30bn Baht ($977m) has drawn criticism against the Royal Thai Army and has also raised the question of its necessity and its usefulness amidst the exorbitant price, considering the aftermath of the failed procurement of 6 decommissioned submarines from Germany for 7.6bn Baht ($250m), which was the highest priority of the Royal Thai Navy until it was eventually shelved. 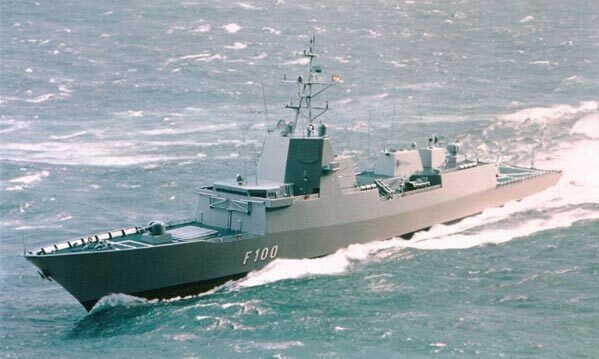 When the Royal Thai Navy ordered the HTMS Chakri Naruebet from Spain in 1992, the country’s only aircraft carrier planned as the Navy’s fleet command center, the price then was only 7.1bn Baht ($231m). 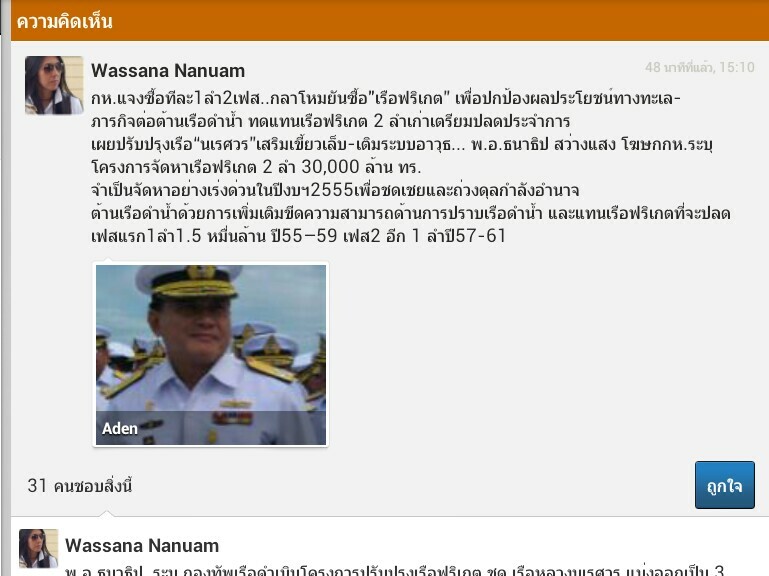 On September 18, 2012 the cabinet of Prime Minister Yingluck Shinawatra has approved the budget to buy frigates weighing 2,000 to 3,500 tons for 30bn Baht, after it was submitted by “Big Oh” - Air Chief Marshal Sukumpol Suwanatat, Defense Minister. The Commander-in-Chief of the Royal Thai Navy, Adm Surasak Rounroengrom (“Big Roun”) has assigned a fellow Class 13 graduate from the same army preparatory school, “Big Jieb” Adm Jakchai Poocharoenyos (Royal Thai Navy Chief-of-Staff) to head the project. 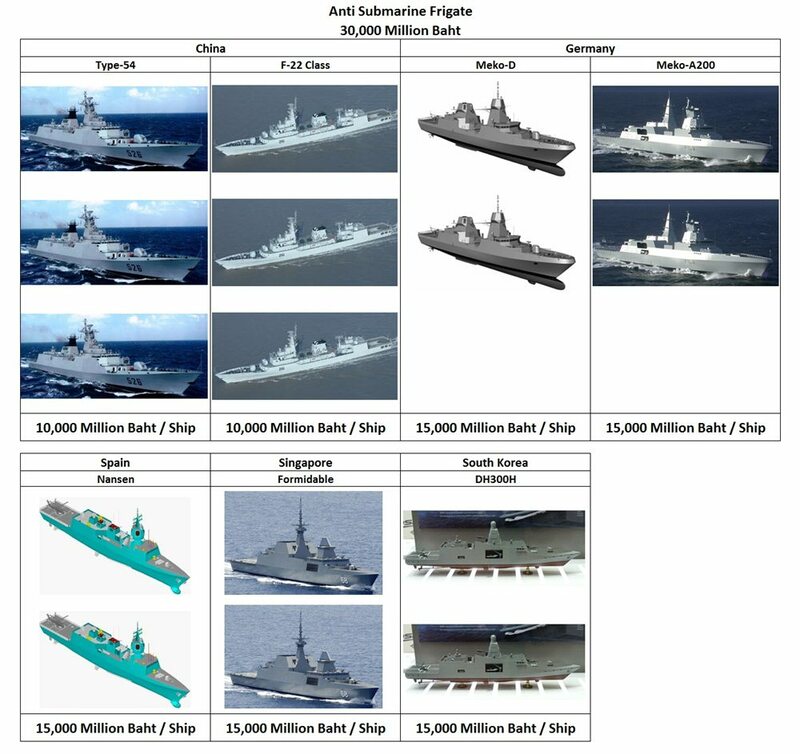 In the planned time frame, the navy wanted to have the approval for the frigates before the end of the fiscal year 2012 [September 30, 2012] in order to regain leverage over the internal balance of power after the failed submarines procurement and also to replace the soon-to-be-decomissioned frigate HTMS Phutthayotfa Chulalok. 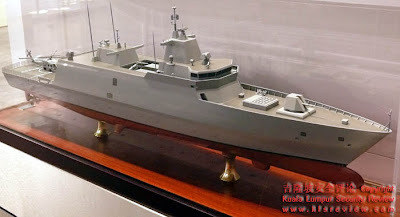 The procurement of the frigates will supposedly take place in two phases: in the first, one frigate for 15bn Baht ($488m) during the fiscal years of 2012-2016 and during the second phase, another one for 15bn Baht during the fiscal years of 2014-2018. 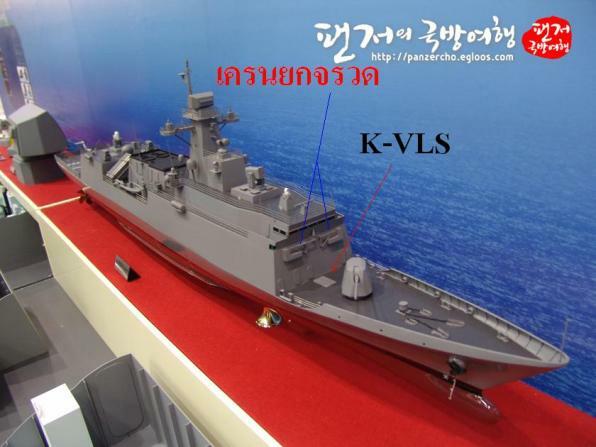 Also, the currently active frigate HTMS Naresuan is being upgraded in three phases, with budget commitments during the fiscal years of 2011-2014, 2012-2014 and 2013-2015. 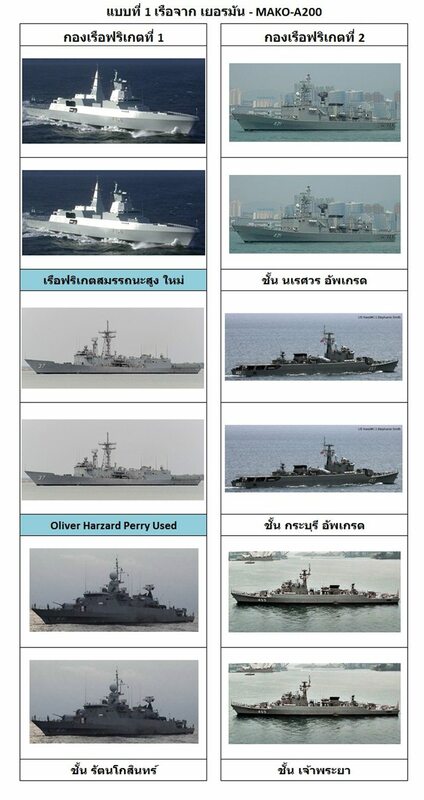 Currently, the Thai navy has two frigate fleets with 11 and 6 ships each. 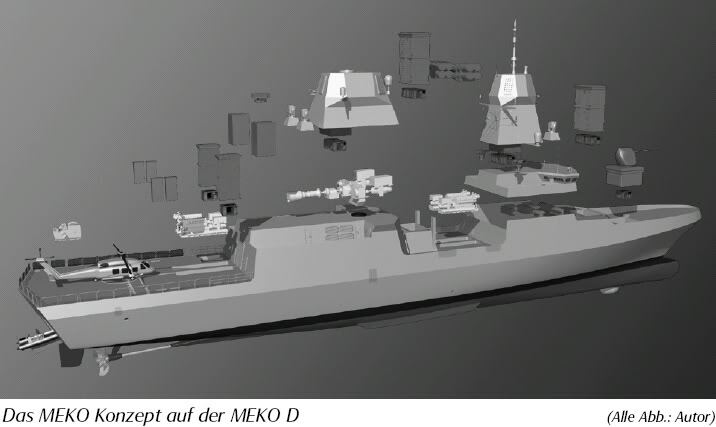 The procurement committee has decided that the new frigates would be from Germany, since they are known for their well-built, high quality ships for a good value. 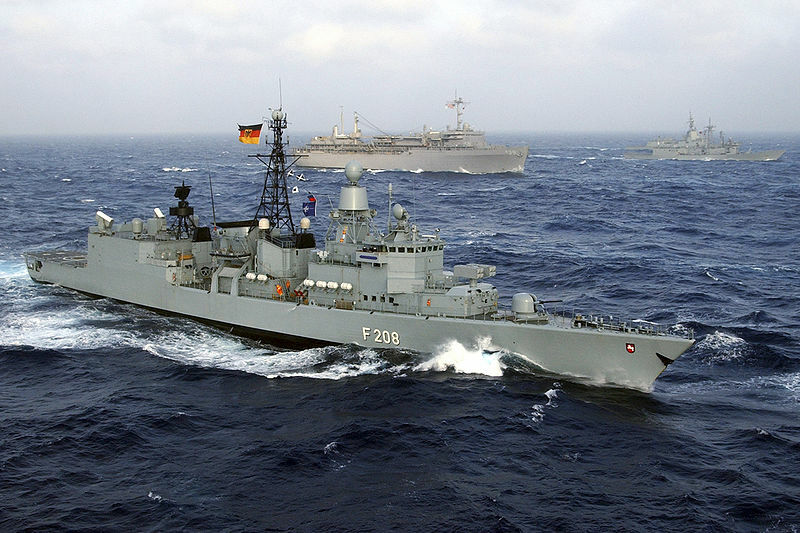 But the navy would have to push for German frigates even more when submitting the request to the Ministry of Defense. The first hurdle there, “Big Tuey” Adm Chaiwat Bukkaratna, Adviser to the Minister of Defense and overseeing this very procurement, will approve it. But there are also rumors that the “Big Boss” [possibly the Defense Minister?] 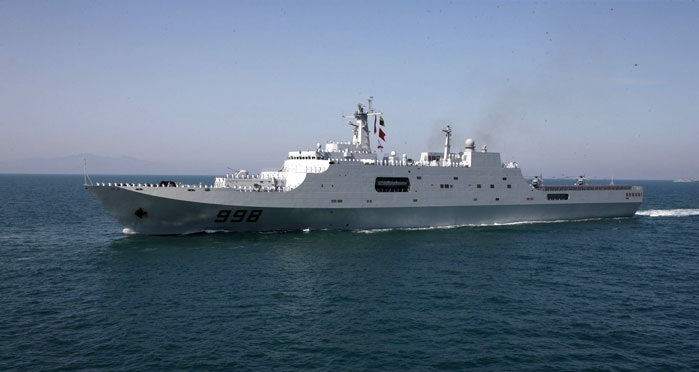 wants to have frigate from China instead, which worries the navy officers in charge, since they fear the Chinese ships would be of bad quality and corrode within a few years. 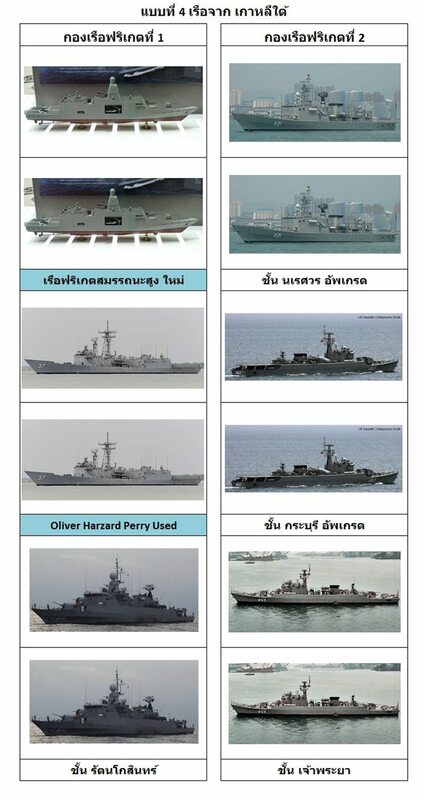 The HTMS Naresuan and the HTMS Taksin were procured from China and then commissioned in 1995, but are now in process of being repaired after growing corrosion and upgraded for total budget of 7bn Baht ($228m). This coincides with rumors that the “Big Boss” [most likely Defense Minister Sukhumpol] has ordered the navy to change the procurement of submarines into the procurement of frigates instead. If they would have insisted to buy a new submarine, the price would have been about 15bn Baht ($488m), same as a frigate ship. But that would still have proven problematic and it could have ended in the same fate like the German second-hand submarines. This wouldn’t have boded well with Defense Minister Sukumpol Suwanatat, who decided to stop the procurement process for the six decommissioned Type U-206 A submarines from Germany worth 7.6bn Baht ($250m) in total by not submitting the proposal to the cabinet for approval. 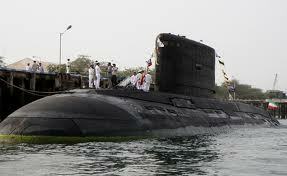 Apart from letting the bidding deadline pass and other “technical problems”, Sukhumpol has ordered Adm Surasak Rounroengrom to look into other types of submarines and prepare the procurements of new submarines instead. However in that case, he would have been accused to have deliberately scrapped the procurement process in order to purchase new submarines from Korea or China. 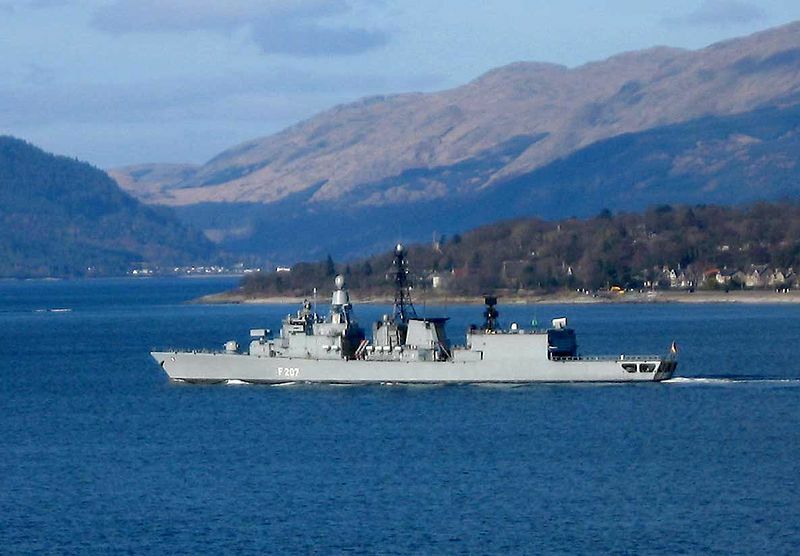 In order to avoid this problem, Sukhumpol thus has altered to procurement to the two frigates instead. 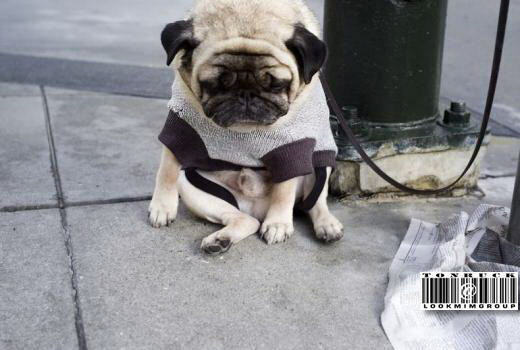 ผมว่า เรื่องของเรื่อง คงที่ กองทัพเรือ เอง แหล่ะครับ...ว่า...เป็น กองทัพเรือ จริง ๆ รึเปล่า ?